The Final Phaseout of R-22 | Controlled Air Inc. 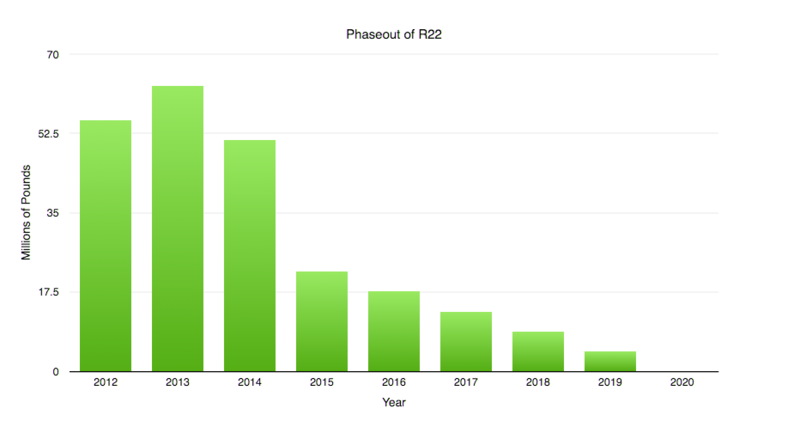 The final phase-out of R-22 will once again be impacting supplies and prices of R-22. Drop from 51 million pounds allowed in 2014 to 22 million pounds beginning Jan. 1, 2015. Subsequently, 18 million pounds of new and imported R-22 will be allowed in 2016, 13 million pounds in 2017, 9 million pounds in 2018, and 4 million pounds in 2019. No new or imported R-22 will be allowed in the U.S. on or after Jan. 1, 2020. Industry leaders estimate the R22 aftermarket consumption for end users to be somewhere between 50 to 60 millions pounds for 2016. With only 18 millions pounds of new R22 and an estimated 8 million pound of recycled R22, there will be a supply and demand imbalance. This will drive the price of R22 up. It’s important to have an understanding about how these changes will impact you and to have a plan on how to address these issues either before or when a major failure occurs. The first step would be to evaluate your equipment. What is the age of the equipment? Is it the type of equipment where it’s more cost effective to replace the equipment instead of repairing when there is a major component failure? The EPA set up regulations to ban the production of heat pumps and air conditioners that contained R-22 after December 31, 2009. HVAC equipment manufacturers discovered a loophole in the law that allowed them to manufacture and sell system components as long as these components contained no refrigerant. This loophole has recently closed and dry units will no longer be available. This change will impact businesses that have smaller R22 split systems with condensing units. Condensing units have a short lifespan so when there is a major component failure in a condensing unit, it is normally more cost effective to replace the entire condensing unit. With dry units no longer available, the first option would be to use an R410A condensing unit and add an expansion valve. In some cases switching to an R410A condensing unit will require replacing the refrigerant piping due to sizing requirements and replacing the evaporator coil. In either case, repair costs and the amount of time needed to replace a condensing unit will be driven upwards. If you have rooftop style units or larger condensing units where normal repair practices are to replace the major components upon failures, your options are to utilize a drop in replacement refrigerant when it’s time for a major repair. There are disadvantages to using a drop-in refrigerant. When you introduce a refrigerant that the system was not built for, you can lose some efficiency. The efficiency loss can range depending on your system and the replacement refrigerant used. Contact us today to get a estimate on what it will take to get your equipment ready for the changeover or to upgrade your system.